This is another blog for my students of film and media. Following on from my case study blogs on Prometheus, Juno and Attack the Block recently, this is the second part of an essay explaining how the Hollywood and British production contexts differ and how these production contexts can affect the films that are produced. Part 1 of this essay on Finance, Production, Technology is here. Distribution techniques for Hollywood and British films differ in many ways, mostly due to the marketing budgets of the films. Prometheus was one of the first movies to have a ‘trailer preview’. Ahead of the launch of the official trailer release, a preview featuring director Ridley Scott was released to let fans know that the anticipated trailer would be released in three days’ time. Also the producers of the film made a series of videos especially shot to be released on the internet and to potentially be spread by movie lovers virally. ‘In concert with the movie's traditional marketing effort, which includes the trailer, Scott and 20th Century Fox have pursued a second, more innovative path to publicity. It began unexpectedly at this year's TED conference, with a presentation by entrepreneur Peter Weyland’ (Gomez, 2012) who is a fictional character from the film. This series of viral videos extend the story and universe of the film in the same way as viral marketing for previous Hollywood blockbusters such as The Dark Knight and Cloverfield had done. The traditional trailers emphasized the science fiction elements as well as the links to Alien and the fact that Ridley Scott was returning to science fiction. There was also a great amount of spectacular imagery and action elements emphasized in the trailer and poster. The use of stars in the marketing also would help the film to appeal to an international audience. 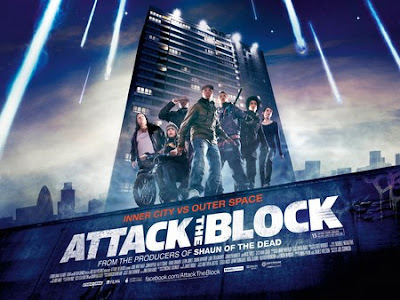 Attack the Block on the other hand uses its only star Nick Frost, the science fiction genre elements and ‘from the producers of Shaun of the Dead’ as selling points to be highlighted in much of the marketing. Nick Frost has some international recognition from Shaun of the Dead but will also help the film a great deal in Britain. The distinctive British location, language and characters are also emphasised and this could be a draw for some audiences but also could put off a wider audience, unfamiliar with the language of Britain’s youth. There was even talk of subtitling the film for US audience. Film festivals are often essential for spreading word of mouth about smaller films. They can win competitions, awards and gain valuable attention from film fans and the press. A screening at SXSW film festival helped Attack the Block to secure distribution in North America. The marketing strategy included posters, trailers, t-shirts and TV spots but was nowhere near as massive as the promotion of Prometheus. 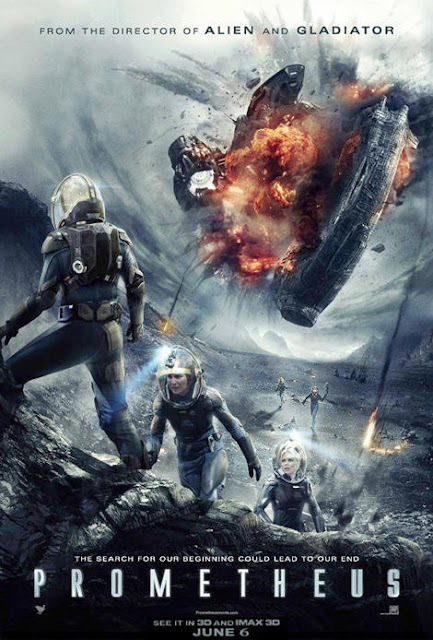 Prometheus’ was released on 3396 screens in the US on its opening weekend allowing as many people to see the film early in its release as possible. Hollywood blockbusters spend so much on marketing a film in the lead up the opening weekend in an attempt to make their money back as quickly as possible. This saturation release strategy works well for blockbusters with mainstream appeal. The stars of the film attend premieres in order to get more written about the film in the media. Charlize Theron, Michael Fassbender and director Ridley Scoot all attended various screening and did interviews to help promote the film. Attack the Block on the other hand had very low opening weekend figures in terms of box office and number of screens. It was released on far fewer screens than a Hollywood blockbuster would be with around 350 screens in the UK and only 8 in America. The distributors will hope for the release to go wider as word of mouth spreads as they will not spend as much on marketing as the biggest blockbusters do. It premiered at a film festival in America as well as in Leicester Square in London with stars in attendance. The premiere of Attack the Block is unlikely to attract the same amount of media attention as Prometheus’ premiere because the stars are not as internationally recognised. Part 3 on trends, genres, social issues and regulatory issues is here.